Budget Bicycle Center has Vintage bicycles from all eras. We sell 1000's of vintage, classic, retro, reproduction, and antique bicycles for the avid collector. If you are looking for a project bike (shop this page) or parts to complete your project, check out our NOS parts for sale pages. 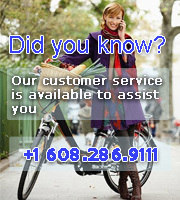 If you have a question about your antique bicycle or bicycle parts, we can answer almost any question! Questions? 1955 Phillips Sports Step Through 3 Speed Bicycle 22"
Classic English 3 speed city bike! All original Deluxe Hornet in need of some cosmetic work, but rideable. Amazing piece of cycling history! 1960 Schwinn Fairlady Two Speed Bicycle 18"
Classic American Schwinn in need of some TLC! 1960 Schwinn Hollywood Cruiser Bicycle 19"
Classic American ladies bike, in need of some light TLC! 1960s Hawthorne Ladies Cruiser Bicycle 17"
Classic ladies cruiser bike in need of some TLC! Classic hand built Huffy with Shimano internal 3-speed hub! 1964 Royal Scot 3 Speed Bicycle 19"
Classy women's bike with generator and front and rear lights. Nothing will stop you on this heavy duty Schwinn HD with 105g spokes and beefy frame.